Man has always been dependent on the ocean. As we began to trade with foreign lands, the importance of ports around the world grew and today they play a critical role as a fundamental part of the world’s transport infrastructure. They provide gateways to the outside world and have enabled nations to transform into export-oriented economies and benefit from foreign trade. With enhanced globalization, the role of ports has changed but coupled with the benefits of trade are the challenges and pressures of security management. Dahua Technology, as an end-to-end intelligent security solutions provider, is devoted to making the world safer, especially ports. The industry is fraught with contradictions. Whilst ports are rapidly expanding, there is no doubt that they need security management, but at the same time there is an urgent need for safe, highly-efficient and manageable services. There is also pressure on operators to ensure proper systems are in place. However, with large port supervision areas and sometimes complex situations, managing this civil defense can be difficult. Usually a port area covers several square kilometers, but some port zones can reach tens of square kilometers. So covering a large jurisdiction combined with complex transportation, then add a large number of entrances, perimeter fences, long channels, large scale storage yards, and the numbers of berths it is not surprising that security needs have led to a dramatic increase in the number of workstations across a port. If only dependent on civil defense, how can maritime security keep checking of regular operations? Now with the development of technology, illegal immigrants and organized crime have also affected safety management. But putting the human resources in place to effectively combat this issue would be very wasteful and in most cases the role would be pretty monotonous. Therefore it makes sense to combine the protection approaches with intelligent defense. Exchange and data-sharing is a part of informationization. Ports view each workstation as a unit in terms of achieving video monitoring data. In most cases, the utilization and management of video and business data are comparatively independent at each station. So there is a lack of an integrated, systematic and multi-level security network system. On top of this, ports have to balance demand for the correct allocation and access control from monitoring centers to sub-centers; sub-centers to monitoring points in customs; port bureaus of public security; maritime bureaus and border defense etc. With the emergence of smart ports, the need for intellectualized safety management has become very apparent, particularly for the automated identification of containers, staff and drivers who frequently entry and exit the harbor. A multimedia integrated management system is required to support the IMS notification at each critical step of flow, and could be used in conjunction with a sign-in system and security system. Integrators can obtain basic data via electronic tags and cameras, to realize a whole-process and omnidirectional management control system for incoming and outgoing cargo. At the same time, the port safety can be guaranteed through facial recognition technology; tracking analysis; and video motion tools in cooperation with broadcast and sound-warning devices. With the continual evolution of video surveillance products and technology monitoring requirements, their application in port zones needs to keep up with the times. Firstly high definition imaging - since ports gather large crowds of people, vehicles and boats across their extensive grounds, if you want to differentiate the details, you need to use a high resolution camera in order to support the application. In addition, poor light and remote monitoring at night are considerations. In a harbor, the majority of attacks happen on a dark night or during heavy fog, so it is important how to ensure port safety in this kind of situation. Current high demands for use in ports include remote surveillance, panoramic monitoring and products which must be explosion-proof and anti-corrosive. So global ports are finding themselves in challenging situations. It is critical to find a way to turn this situation around. 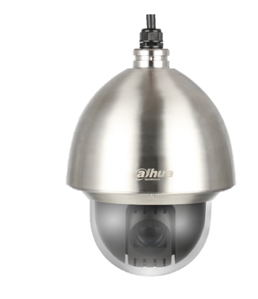 Dahua technology is dedicated to make the world a safer place. Based on decades of accumulated experience and technical expertise, it is advocating a perfect end-to-end intelligent video surveillance solution against potential danger. Regarding system architecture, Dahua Technology has adopted a centralized management model for video surveillance systems which considers the port’s inner operational management mechanism. The centralized management model belongs to a second-tier monitoring, which means a monitoring center is established in the port to realize centralized management for all system resources. Command centers and sub-control centers meet the requirements of command dispatch and monitoring management from top level customs and police stations to subordinate customs, maritime affairs and frontier inspection departments. Overall, the chief control center is responsible for all access and management of system resources. 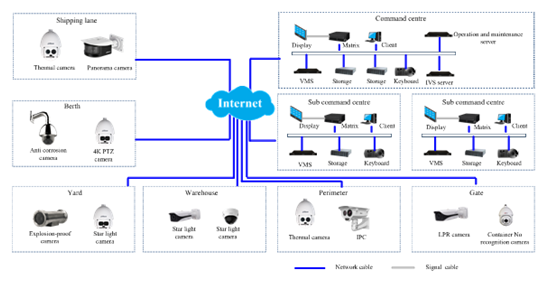 This includes the monitoring management platform, device access, intellectual analysis system, video storage system and video surveillance system. The control center monitors the general running of port operations, and coordinates safety commands at each unit of the port. In this centralized management model, the control center plays a role obtaining, displaying and controlling the key video resources, while the sub-control centers mainly provide real-time video surveillance and safety guard management for business departments, such as customs, frontier inspections, and quarantine and inspection departments and so on. It is not difficult to realize that this infrastructure efficiently solves the challenge of sharing and multi-level administration between departments. It also provides highly-efficient and easy-to-operate services for ports. Although Dahua Technology has an excellent system architecture, in order to further satisfy users it is continuing to research on the particular needs of ports. The entrances to ports have undergone technological transformations in recent years. Dahua Technology has developed an ID system at the entrance control which can identify the license plate. It is a multimedia management system which is combined with a variety of advanced technologies including image contrast, character superimposing, voice function, query service, etc. Users can check the vehicle access and statistics reports from any terminal. Meanwhile, a “Blacklist” database is stored in the platform software, so any blacklisted vehicle will be recognized and prohibited from passing, otherwise, it can pass freely. For entrance zones, Dahua Technology has started an automatic container equipment identification system, which automatically recognizes the container number. It has a well-run development kit and software interfaces which make it easy for integration with other system. The system operating process includes interface for immediate alarm triggers, photo shots, number recognition, data storage and data transmission. After receiving the results from the recognition system, clients can undertake relevant operating procedures or back-end processing, such as comparison, analysis or release. 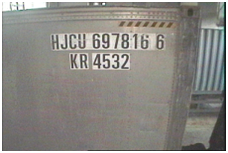 The warning function module of image identification is used in container terminals. This can function as an early-warning system and protect cargo from being stolen. An Intrusion Prevention System can also be added to enhance security and confidentiality. The facial recognition system from Dahua Technology is installed in different places, but has a unified management system. Real-time video surveillance was developed following in-depth research into the technology of neutral networks, mass data storage, and data computing technology. The monitor would transmit the images and videos in forms of video stream or image stream. It does not only show people’s faces in any given situation, but can also store all still images. The real-time videos and images of vehicles and containers will be transferred to digital information storage. By using the ISO number, container number or facial recognition information and integrating it with the logistics, quay, yard or customs system, users can find the global location information of containers. This means that the daily management procedures are more automated and efficient including the gateway and cargo management, container inventory management, site planning, management charges and other related logistics management. It saves time in checking the containers, and minimizes rates of manual error, then strengthen safety of quay entrance. Berth monitoring is the most important step in the process of port protection. For the loading and unloading of cargo in large container terminals, there is high demand for high-definition video surveillance to record all information. For the coastal location, there is a need for cameras with a wide dynamic range, backlight compensation, and an anti-shake function. Dahua PTZ is equipped with quick and smooth control, high quality image and anti-corrosion protection, so it is a well-designed to berth monitoring. This camera is suited to even the harshest of anti-corrosion conditions. Its 6KV lightning rating provides protection against the camera and its structure from the effects of lightning. With a temperature range of -40°C to 70°C (-40°F to 158°F), the camera is designed for extreme temperature environments. The camera conforms to an IK10 impact rating making it capable of withstanding the equivalent of 55 kg (120 lbs) of force. Subjected and certified to rigorous dust and water immersion tests, the IP68 rating makes it suitable for demanding outdoor applications. The container yard, is a crucial stage of the cargo distribution process. It is a wide open space but can present complex issues because it can easily become crowded with a vehicles and people making it hard to identify personnel. So the key facilities should be monitored through using 24-hour uninterruptedly monitoring. Then for critical places, comprehensive surveillance should be added for the loading and stacking points of valuable cargo. The system needs to be reliable, stable and able to respond quickly. Any abnormalities can be immediately detected and are linked to all departments so that timely action can be taken. Specifically for this issue, Dahua Technology has introduced a TPC series of thermal-imaging cameras, which include thermal imaging technology using small and medium sized gun-shaped cameras for night protection. Unlike other companies using laser infrared lighting technology, Dahua Technology uses thermal imaging technology, which is far more effective than other methods. Specifically designed, this dome camera has a separable lens and wiper function, which means it can adapt to extreme weather conditions and can be installed in an open yard. Since ports usually cover customs and excise, only authorized personnel are permitted. For perimeter areas, first of all, we have to consider factors such as long distances, the effects of night images and intelligent alarm systems. 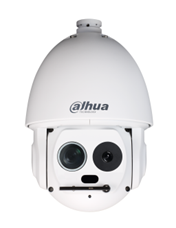 Dahua’s thermal-imaging dome camera’s monitoring range can cover hundreds of meters and even a couple of miles. The thermal imaging system can set up an intelligent intrusion analysis and alarms, coordinating to discover and detect illegal personnel and foreign object. Once it sends an alarm signal to a control center, it will issue visual images to staff on duty for confirmation and identification. It can also recognize the intruder and track the location using video image. It has excellent performance for fire detection, overstepping and zone intrusion. Channel monitoring faces problems, such as a short monitoring range, low resolution and poor night vision. The Dahua panoramic camera has a wide-angle view, and efficiently improves the capability of emergency commands. This product has a 180degree tiled display and aims to help supervisors directly visualize the whole channel and its surrounding environment. At the same time, it can use thermal-imaging cameras for long distance detection at night in order to quickly find the target. In the future, ports will become more intelligent reforming traditional management approaches. Using high-definition, intelligent and internet video technology, and combined with effective products and systems, Dahua Technology provides global port units with safe, efficient, and easily-operated intelligent solutions for port video surveillance and the safeguarding of ports!